There is a range of venues for hire in Goomalling and the Shire hires out various items that you might need for your event. Jennacubbine East Road, Jennacubbine The Jennacubbine Hall is available for hire for social events and other functions as requested. The Hall has a large open floor space with a kitchen and servery facilities. Contact the Jennacubbine Hall Committee by phoning Michelle at the Jenna Tavern on (08) 9623 2273. 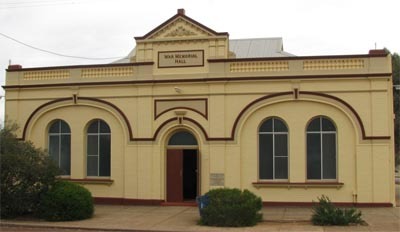 The Konnongorring Hall is available for hire for social events and other functions as requested. The Hall has a large open floor space with a kitchen and servery facilities. Contact the Konnongorring Hall Committee by phoning Carmel Whitfield on (08) 9620 1225. When these items are used on Council’s property there is no charge. The following charges only apply where the items are hired for use on non-Shire property. All items are to be booked out and checked on return by the caretaker. These can only be hired inside the Shire Hall, Pavilion or Sports Complex.